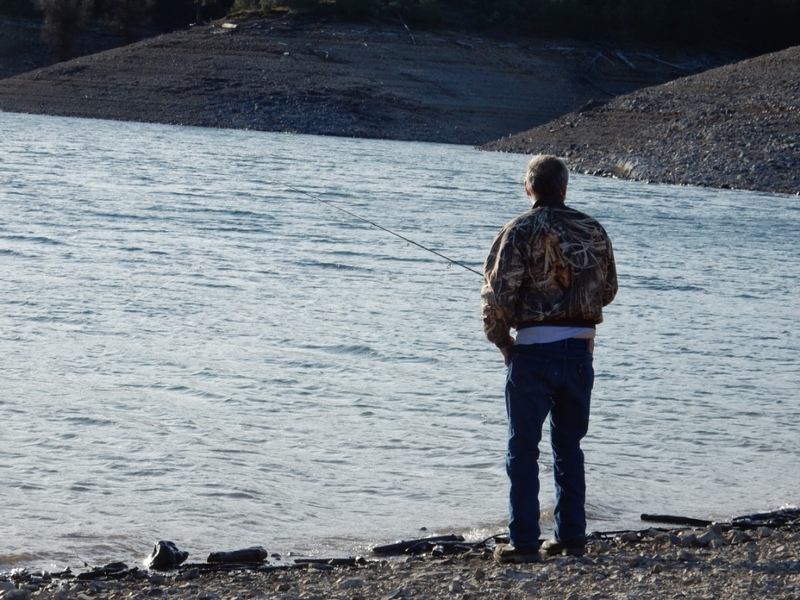 Fishing was enjoyable at Shasta Lake on a windy day, but Russ Herrick, seen here, and I didn’t catch any trout. In case you haven’t noticed, the weather lately has been way too good to keep us inside for any length of time. That being the case, my friend Russ Herrick and I headed for Jones Valley and the shores of Shasta Lake the other day. Our goal was to do a little bank fishing for trout which, I heard from a friend, were biting like mad on Berkley Power Bait and lures. The fishing was enjoyable, as it always is if you have the right attitude, but the catching left something to be desired. In spite of our efforts, we were skunked. We blamed it on the stiff north wind that was relentless as it made casting difficult and bite detection nearly impossible. And then there was the incident that took our minds off of fishing altogether. At one point I turned around and noticed smoke coming from a fire pit that was obviously unattended and, I’m guessing, was probably left after party time the night before. I can see how that might have happened. After all, you would have had to walk all the way to the lake for water to put out the fire, and that was a distance of 100 feet or so, and apparently no one had a bucket. Hey, they did have containers that would have done the job. From the debris around the pit It looked as if someone had overturned a garbage can and left the contents there for the wind to take care of. I mean there were cans, bowls, bottles, melted plastic and who knows what all strewn about. I’ve seen worse, but that doesn’t make it right to not pick up after ourselves. The sight was galling to Russ and me as it reflects on anglers and paints us as slobs. In this case, we doused the glowing embers, filled a plastic bag with junk and put it in a trash container. We weren’t smiling when we did. Maybe, we’re just old and out of the loop. We don’t care about the technical revolution, but we do care about the resources we use. Those of us who consume natural resources through fishing and hunting should not be blamed for the actions of a few slobs. Unfortunately, their disrespect for the land reflects on all of us. 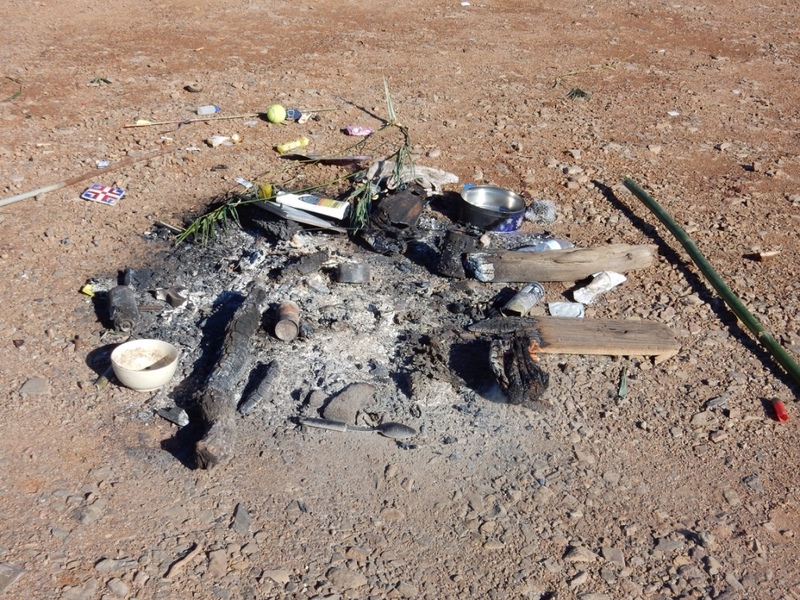 At one point I saw smoke coming from an abandoned fire pit. After Russ and I put it out we picked up the mess left by who knows who. 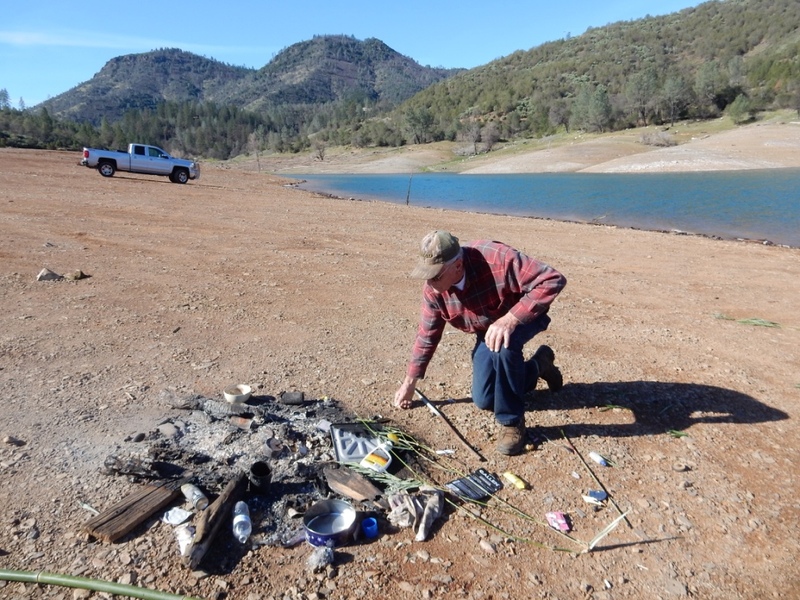 There’s really no excuse for folks to leave their mess behind after camping, having a party, or whatever, on the shore of Lake Shasta or anywhere else.